A Renton Washington customer having found the need to build a two car metal garage for his daughter sought out different construction companies. What impressed him the most was the professionalism and expertise of the PermaBilt® Building Representative. 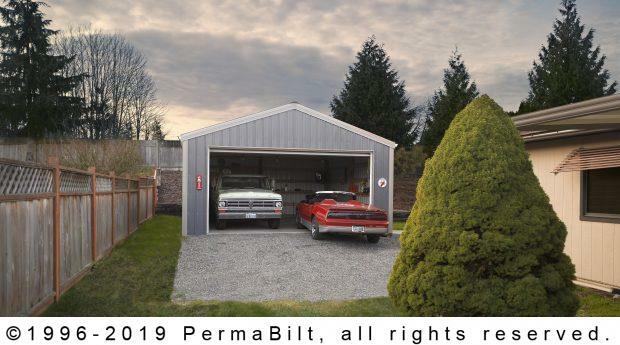 In discussing his need to build a two car garage with plenty of storage space, he quickly knew that PermaBilt® indeed had been in the business of constructing post frame buildings since 1973. Just handling the permitting process to be complicit with county codes was huge for him. Our permit department prepared all the application materials and brought the application to the County and efficiently dealt with questions the County had about the property and the proposed project. Even though it was a standard garage that is the staple of the 20,000 buildings constructed since 1973, we took our customer’s garage as serious as the first one we built with quality always top of mind.